HEROES POP SWAP :: OCTOBER 25, 2014 :: RESERVE YOUR SPACE! 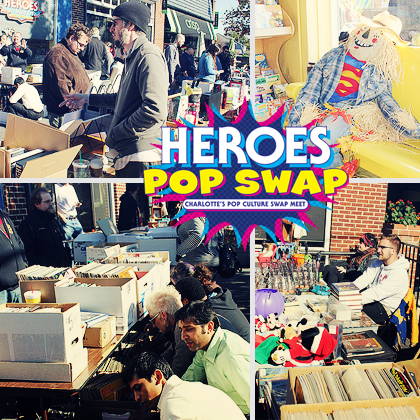 Join us for our 3rd Annual Heroes Pop Swap, Saturday, October 25th 10AM-4PM at our store. Whether you have things to sell, are shopping for treasure, or you just want to give your Halloween costume a test run, the Pop Swap is sure to be a great place for it! A 6′ table is only $20 and you can be sure your great collectibles will be going to a loving home. This event is limited to local creators and comics and pop culture enthusiasts (no professional dealers) who have interesting items in their personal collections that they are willing to sell and self-produced comics and related products. People who are purchasing space are encouraged not only to bring comics but any items falling under the pop culture umbrella. That could be toys, games, music, movies and more. Space is limited and reservations are 1st come, 1st served. CLICK HERE TO REGISTER FOR YOUR TABLE TODAY!